Who doesn’t just enjoy spending time vegging it out in front of their TV? And with so many new ways to enjoy your favourite movies and TV shows, you need to have a relaxing and comfortable space to watch TV. In this Ideabook we look at 9 fantastic and stylish media or living room spaces that are sure to inspire you. 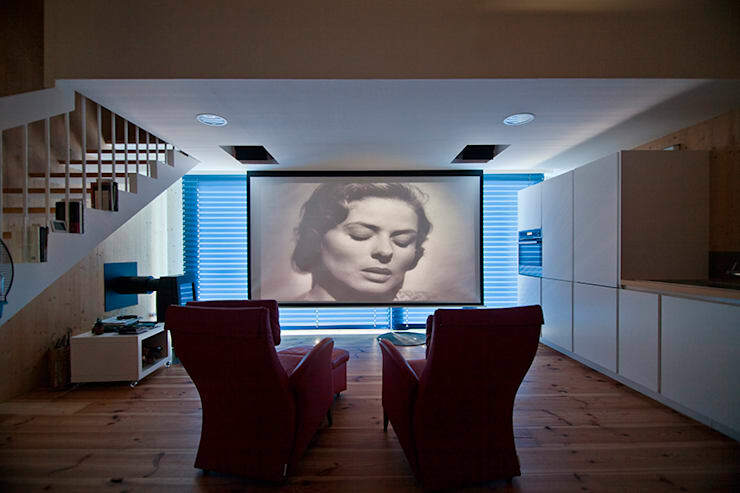 Whether it be eagerly anticipating the release of the latest episode of the series you are hooked onto, or the football match of the season… homify has compiled this feature to make your home that much more comfy! The wooden panels, white and black carpet as well as minimalist décor, does a lot for the acoustics of this media room. It’s simple and stylish, but a simply delightful design choice! This room has two ergonomic leather chairs with foot rests, what better way to enjoy that all time classic movie? Now just a large cooldrink and a big bowl of popcorn and you’re all set! Comfortable seating… check. Dramatic lighting… check. Space for food, snacks and drinks… check. And of course stunning TV screen… check. 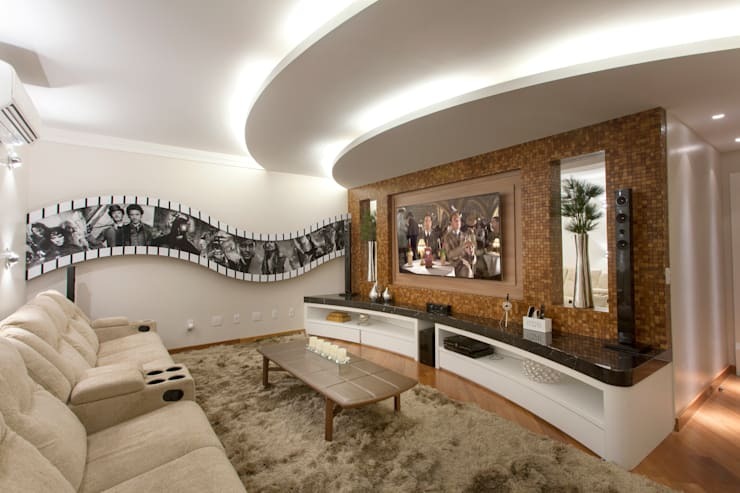 Now just sit back and enjoy this perfectly themed media room with all your favourites on the playlist. This idea is great for a smaller home, where the media room idea is incorporated within the living room. The L-shaped sofa takes full advantage of the corner space, while the coffee table is perfectly placed as a rest for food and drinks. 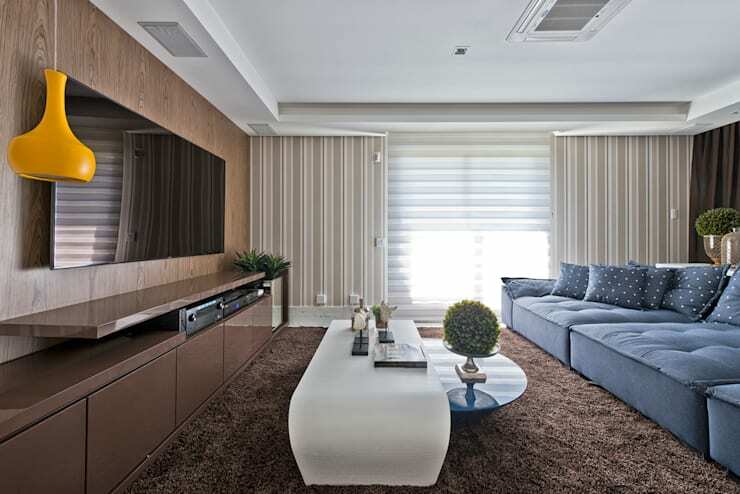 The neutral colour choice of this room makes for a trendy and contemporary style too. The interior designers ensured that the ambiance of this room is undoubtedly dramatic, creating an almost real cinema style space, with perfect lighting and deep grey walls for that authentic look. This TV room has an undeniable retro vibe. The chic shag carpet adds a creative affect to the acoustics, while the armchair is great for relaxing and unwinding. 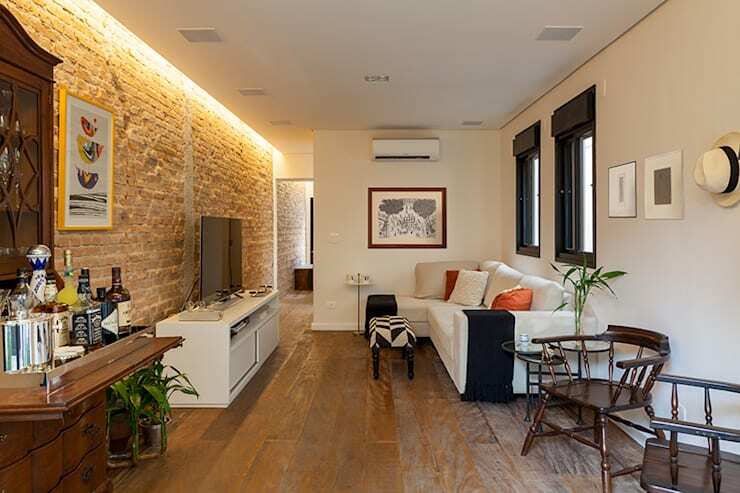 The large flat screen is an attractive choice, while the lighting and wooden furniture makes perfect sense. 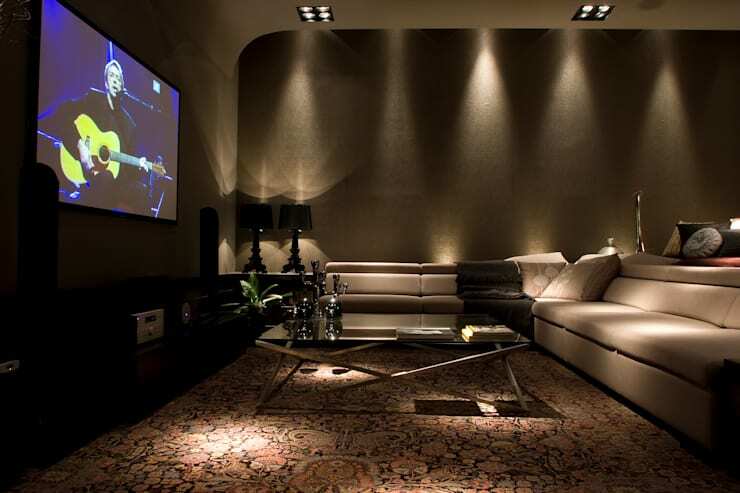 Watching TV and mixing music – this TV room is the perfect space to do either. Each aspect of the design has been perfectly thought out, from the acoustics, to the graffiti walls and even the block out blinds. So go on… and make some noise! 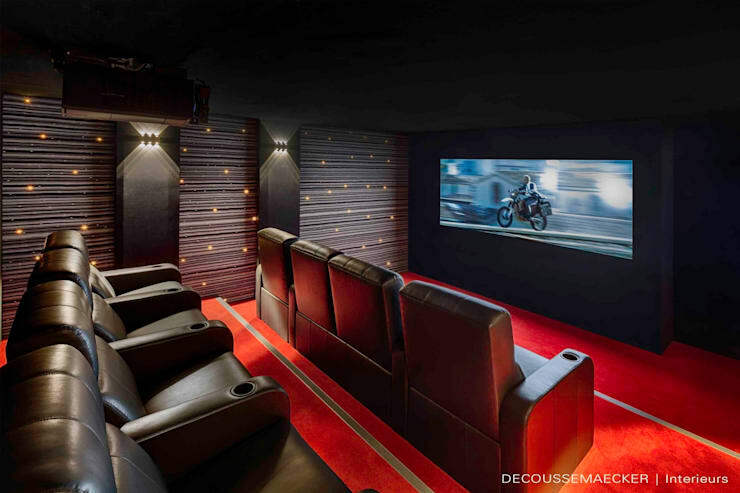 This mini-cinema was designed with imagination in mind. From the cinema style screen to the starry sky and even the inspired yet comfortable seating in the centre of the room. The room even has a small stage with theatre curtains and a red carpet, so karaoke or comedy night will never be the same again at your house! The media room is one of our favourites at homify! 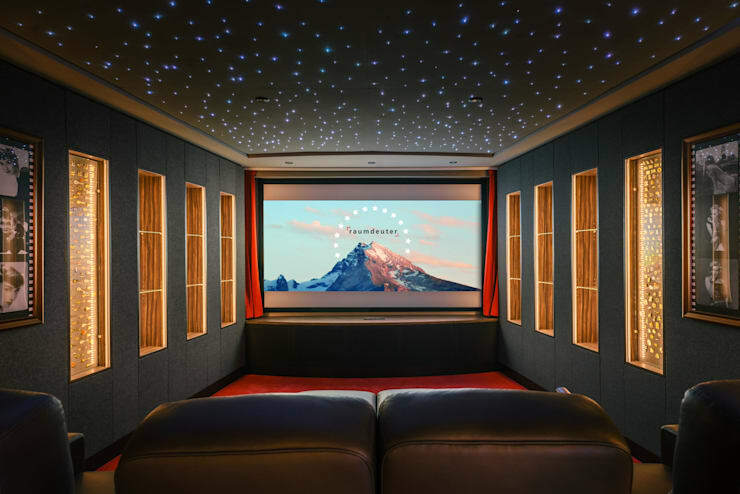 It looks like a real movie theatre in every way, from the large and comfortable seating with arm rests, fabric covered walls to improve acoustics and even the authentic lighting leading the way to the seats. What better way to enjoy that action movie? Behold! The high-tech home is a great read too. Which home cinema was your favourite?